Armed extremists who are fighting on the side of oppositionist units in in Syria have attacked the ancient Orthodox Monastery of Holy Prophet Elias near the town of Al-Qusayr situated 20 kilometers from the Syrian-Lebanese border, reports the ITAR-TASS agency with a reference to the Syrian state news agency. The gunmen have devastated this Christian monastery, taken away the church vessels, blown up the bell tower, and destroyed the chancel and the font, the Monastery’s Abbot Gadir Ibrahim reported on Saturday. On top of all that, according to the Abbot, they have demolished the statue of the Old Testament Prophet who is venerated in Syria by both Christians and Muslims. “The desecration of the church and the monastery has been committed by foreign mercenaries,” assured Ibrahim. 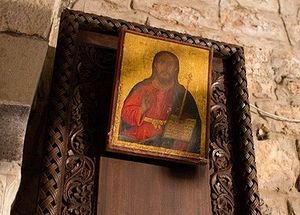 According to him, “Syrians would not have dared to commit such a sacrilege.” The Abbot noted again that the monastery is already more than 1500 years old and it is under protection of the state as an architectural monument. For last two years of conflict in Syria, dozens of churches and mosques have been destroyed there, especially in the cities of Homs and Aleppo. Also, an ancient synagogue in Jubar near Damascus has been damaged.